Okay this is my TNT dress pattern, there are no new construction tips. However, I did have to take a lot of care when applying the lace to the silk charmeuse underlining. That was a three step process. *First the two pieces were pinned together using ALOT of pins to insure that the lace fabric was attached together everywhere. *Then I ran a basting stitch through the center of the two pieces and around the edges of the two pieces. *Finally the sides were serged together. The point of all these stitches was to insure that the two pieces functioned as one. I didn't want the dress to be two pieces - a lining and the lace fabric...again going back to ease of wear. I also had to take care when inserting the invisible zipper. The cotton lace was very bulky in certain points so I wanted to leave some space for the fabric to meet but not get caught in the teeth. Even stitching the seams had to be done more carefully so that I wouldn't catch any of the lace or the lining in the stitching. As well as putting up the hem...at one point I thought about just cutting around the lace motifs and leaving them as is. But I thought of this great idea too late into the sewing process, because I didn't have enough full lace motifs to follow through. I ended up adding a one inch hem, pressed up carefully and pinned at every motif. I added rayon seam binding to the hemline and then carefully hand stitched it to the underlining. Which ended up not being careful enough, since I had to go back in undo some of the stitching and sew it down again...but it was worth it! *I had to take a lot of care with sewing this dress because of the thickness of the lace motifs. *Even though I've made this dress several times, these fabrics caused it to fit a little closer than usual. So I have very small seams to insure that it has the ease I want in the final dress. *The silk charmeuse lining is inserted with the matte against the lace. The shiny side looked too dressy for work. *This was an expensive (for me) dress to make up ~ the cotton lace was $20 a yard and the silk charmeuse was $32 a yard. Not exactly inexpensive but worth every penny because I got the dress I wanted! 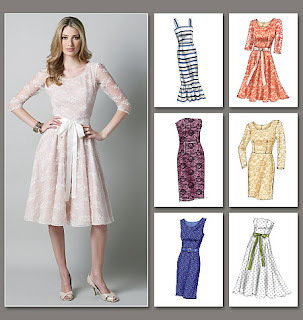 Since my trendy lace dress is made from my TNT pattern, I'm once again featuring current dress patterns that you can purchase or may already have in your pattern collection, to make a similar dress. I'm glad that I've made my own version of the trendy lace dress and using this particular fabric presented enough of a sewing challenge to make this a very rewarding sew. This dress embodies the spirit of my "Ye Olde Familiar" series because the fabric is the essential element of the dress. So this is one more completed dress off of my sewing list. I'm now moving onto my July project! Carolyn, I love, love, love the lace dress!! It is absolutely beautiful. You have now inspired me to make a tea dyed dress for summer. You sewing is beyond words. I learn something from you every time I visit your blog! Until next time. Beautiful and perfectly on trend! My daughter's Easter dress was white lace over pale blue, and since then we've seen the lace trend everywhere. This dress looks very very rich. Love the look on you! Your lace dress is absolutely beautiful...You did a wonderful job! Really, really nice Carolyn! I love everything you've done to complete this dress, just stunning on you! I love what you have done with this dress and the fabric. It turned out fantastic. Worth every cent. Your lace dress is gorgeous! Lace may be trending now, but that dress is timeless!!! Another winner! This is absolutely gorgeous. The color, the fabric, everything, is just perfect. And it looks beautiful on you! Gorgeous fabric and a simple TNT is the best way to show it off I think. I bet this dress feels amazing to wear with the silky charmeuse side against your skin. This is such a beautiful dress, Carolyn and you look fabulous. Thanks for all the tips and inspiration. That is one beautiful dress and you look stunning in it!!! I love your lace dress. It is beautiful and looks great on you.. Happy sewing. Your lace dress is fabulous! You look wonderful in it. Even as you were describing it, I get a sense that it will be extremely comfortable. When the fit and the fabric is this good all I can do is sit back and admire! Beautiful! The simple style really showcases the lovely fabric. Your lace dress is really lovely, and as always, inspirational. Do you have any tips/instructions on inserting invisible zips? My few attempts have been quite disastrous! A beautiful dress, Carolyn. And I appreciate the underlining tips. I have some lace fabric(s). I can't seem to decide whether to underline, or just wear them over opaque garments, but this is very useful info. It's a great dress. I love that you've taken your inspiration and made it yours. Your tea dyed dress is lovely Carolyn. Love the hue you achieved. I was almost cursing at you in my head...yes jealousy is an ugly thing. You look absolutely beautiful and I wish it were me wearing that tea-dyed lace dress. Gorgeous and worth every penny indeed! Really, really pretty! I love that the simple pattern allows the lace to be the focus. Great job! I love how you incorporated lace into a work-appropriate garment. I love the look of this dress! Great job! You *need* to take a lesson from Erica B and "train" your photographer to get close-ups of the shoes woman! We shoe hoarders just have to see! That is a beautiful dress! And thanks for the tips on sewing with lace. Your dress looks gorgeous on, and thanks for the tips - I do have McCalls 6505 in my pattern stash but just not the right lace to sew it up yet. Actually, it sounds like a bargain for such a luxurious and up to the minute dress that fits perfectly! Great fabric choice! It's just beautiful! Ooo that looks the business and worth every penny. I bet yoou feel so luxiouriously in it. I have gone lace crazy. Love lace shirts. I've been waiting for you to finish this dress and it is just beautiful! Thank you for the tips and recap towards the end of your post. The thought of stitching an invisible zipper through the thick lace and silk sounds intimidating but you managed beautifully. Maybe a tutorial on this one day?? You did a fantastic job and it looks great on you. I have Mccalls 6505 & 6460.. Thanks for the inspiration. Elegant, Carolyn--you managed to pull off on-trend and timeless in one garment! And I'm sure the shiny side of the charmeuse feelis absolutely delicious against your skin! Well what can I say that hasn't already been said so I will just have to agree with everyone...amazingly beautiful! Tea-dyed fabric. Wow! I have never tried that technique but keep wanting to. Terrific fit. It looks so comfortable. Ah yes, your post reminded me of of the challenges of sewing lace. But as your dress proves, it is so worth it! Gorgeous! You did indeed get a lovely dress; charmeuse and lace, two tricky fabrics to work with but, as always, you did a fab job. I was waiting for this one ever sice I saw you tea-dyeing. A great result. Now, I wonder if I will ever be brave enough (and skilled of course) to dare doing something like that. You are such an inspiration. Thank you! Wow. Stunning! Really, really beautiful. This might be my favorite thing you have sewn so far this year! Oh, my, gosh! Absolutely gorgeous! Just beautiful Carolyn.I love the effect you achieved with the tea dye. LOVE your version of the LACE dress. It's really cool. Great job. Okay...I've been wanting to make a lace dress but can't put it together in my head. This is LOVELY. I like the boldness of the lace! It looks more classy than trendy. Why am I not following you? Gotta fix that! Love it! Lovely dress, Carolyn. It's wonderful to have that special go to pattern that never fails. Lace is so elegant and I'm glad it's so "in". I see a few more lace pieces in my future. Well done as always. Oh, gracious, what a pretty little dress on you! I'm Leaving it All in the Front! Calling all New York Sewists!